The Scottish Traditional Boat Festival has been recognised by the Scottish Parliament as “one of the country’s leading tourism events”. Banffshire & Buchan Coast MSP Stewart Stevenson has tabled a Motion in the Parliament congratulating the organisers on the twentieth anniversary of the event, which was held at the weekend. “This year saw a milestone for the Scottish Traditional Boat Festival in reaching its twentieth anniversary. “It is a truly great thing for Portsoy and the Banffshire coast to have such an event which attracts thousands of visitors from near and far and provides a huge annual boost to the local economy. That the Parliament congratulates the organisers of the Scottish Traditional Boat Festival and its chairman, Roger Goodyear, on the event's 20th anniversary; understands that, since 1993, it has grown from a local celebration of the 300th anniversary of Portsoy Harbour to become one of the country’s leading tourism events, which generates £1 million for the Banffshire economy, and believes that, through the £400,000 renovation of the historic 19th century salmon bothy, the operation of the local caravan park, and many other ways, the festival has delivered immeasurable benefits to the Burgh of Portsoy. Banffshire & Buchan Coast MSP Stewart Stevenson has backed up his praise for the Buckie Thistle Football Development’s Community Alert Day, which he attended recently and judged to be “truly impressive”, with recognition for the event in the Scottish Parliament. Mr Stevenson tabled a Motion commending the event and applauding the organisers for staging it. “I thoroughly enjoyed attending the Community Alert Day in Buckie recently and it thought it was a very worthwhile event for those attending. “I sat in on a number of the presentations and it was clear that we have another year-intake of active and engaged pupils who were not only enjoying making friends from other schools but also asking serious questions of the various agencies involved. “Buckie Thistle Football Development and their partner organisations are to be commended for this initiative. 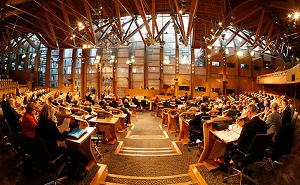 That the Parliament commends the drug and alcohol awareness Community Alert Day, which recently took place at Buckie Community High School for primary seven pupils in the school’s catchment area; applauds Buckie Thistle Football Development, NHS Grampian, St Andrew’s Ambulance, Police Scotland, the Scottish Fire and Rescue Service, Quarriers’ Carers Support Service-Moray, local sports clubs, Active Schools and the Out of the Darkness Theatre Company for helping to deliver this event; considers that the advice on drugs that the pupils received will play a vital role in helping to ensure that they know the consequences of taking drugs; understands that the event gave pupils the opportunity to participate in a range of activities, thus showing them that there are alternatives to drug taking, and applauds the work that the Scottish Government is doing to ensure that Scotland’s school pupils are educated on the consequences of substance misuse, allowing them to make informed choices about how best to lead a healthy lifestyle. Banffshire & Buchan Coast MSP Stewart Stevenson has hailed the Scottish Government's focus on preventing crime, as official figures showed that recorded crime in the Grampian area - and across Scotland - has plummeted for a sixth consecutive year. Between 2011/12 and 2012/13, recorded crime in Grampian fell by a further 12% - including a drop in non-sexual crimes of violence by a fifth. Since the SNP took office in 2007, recorded crime across the region has fallen by 35%. Last week it was revealed that the number of police officers in the Grampian area has increased by 10% since the SNP took office, more than the Scottish average and taking the total to 1,512. “These crime statistics show just why the additional police officers the SNP have delivered in government are so important. “Recorded crime has fallen in the Grampian area by 12% in the space of just a year and by 35% since the SNP took office. “That fall in crime has only been possible thanks to the incredible efforts of police officers across the area, and shows why recruiting more than 1,000 additional police officers across Scotland has been such an important SNP policy. In Grampian, the number of police officers has increased by 10 per cent since the SNP took office - even more than the Scottish average. “The SNP delivered the extra police officers that are driving down crime for people in the North-east." The news that Scotland continues to lead EU progress on reducing carbon emissions has been welcomed by local MSP Stewart Stevenson. Official figures released today by the Scottish Government show a 9.9 per cent year on year reduction on unadjusted emissions – the largest reduction on record - and good progress being made across a range of sectors. The figures also show that Scotland retains its position at the top of the EU15 countries for emissions reductions and has met the Scottish Government’s climate change reduction goal in percentage terms – with a 25.7 per cent reduction between 1990 and 2011. “Under this SNP Government, Scotland is now more than halfway to achieving its 2020 target of reducing emissions by 42% and these figures are welcome news of the great progress that has been made. “I also welcome that we have met the annual target in percentage terms, demonstrating Scotland’s commitment to emissions reduction that sees it still leading all other EU15 countries.